Which green vegetables will have the biggest impact in these diets? Mediterranean Versus DASH Diets: Which one is right for you? 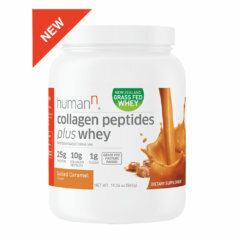 Most of us have been tempted by the allure of a fad diet at one point or another. After all, who wouldn’t want fast results that surpass even the highest expectations? But if you’ve ever tried one of those diets, you’ve likely been burned. Fad diets fade from the limelight quickly because they don’t have staying power. If a diet isn’t sustainable, it’s not going to change your life. It may help you temporarily lose weight, but that’s more of a cosmetic band-aid than a health strategy. It can also be difficult to determine what’s healthy and what’s not, unless you have a degree in nutritional science. Just because a diet is popular doesn’t mean it’s good, or bad, for your health. But there’s one food that every diet can agree is good for your health— specifically your heart health. That food is green vegetables. Green vegetables arerich in highly beneficial nutrients and they should be a staple in every heart-healthy diet. You probably already knew that greens are good for you. We’re not here to overstate the obvious. Instead, we want to share why diets centered around greens have such staying power. And we’ll also touch on exactly what these powerful green vegetables do for your health. Two of the diets that always make the top of anyone’s list are the Mediterranean diet which was cited as a good example of how we should eat by the 2015 Dietary Guidelines for Americans, and the DASH diet which was named the best diet in the United States by U.S. News and World Report for 8 years in a row. Let’s dive into what has made them so popular among Americans. These diets are not only easy to follow, but they are based on some solid principles. Eat more of the good stuff (mostly greens), and you can even include some of the bad stuff (sugars and alcohol) in moderation. When a diet helps you look and feel amazing, you’re likely to stick with it. And when you see someone else thriving on a diet like this, you’re likely to want to try it, too. This is how greens-based diets like the Mediterranean and DASH diets have had so much staying power. The Mediterranean diet is based on the eating patterns of people who have lived on the shores of the Mediterranean Sea. 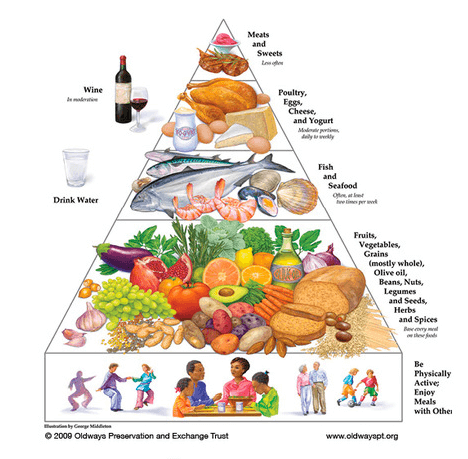 Much like the U.S. government nutritional recommendations, the Mediterranean diet offers a pyramid-style format instead of prescribing specific amounts of any one food group. The base of the pyramid includes vegetables, fruits, nuts, whole grains and vegetable oils. Unsurprisingly, seafood plays a large role in this diet with 2 servings of fish recommended weekly. Poultry and dairy are recommended in moderation, and red meat, pork and sweets can make an occasional appearance in your diet. Although you may find books and websites designed to help guide your Mediterranean diet, there really isn’t one set plan. It’s more like dietary guidelines than a detailed meal plan. The guidelines were first introduced by the American scientist Dr. Ancel Keys in the 1950s, but the concept didn’t gain traction in the U.S. until the 1990s. Since this diet is backed by science, we do have some studies that indicate its potential benefits. 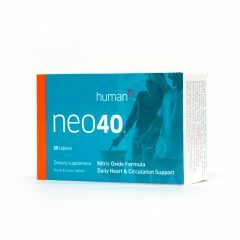 For example, The New England Journal of Medicine found that people at a high cardiovascular risk had less incidence of major cardiovascular events on the Mediterranean diet than those assigned to a reduced-fat diet. If you’re actively working to improve your heart health, you’ve probably heard of the DASH (Dietary Approaches to Stop Hypertension) diet. If you’re following this diet, you’ll need to cut back on foods that are high in total fat, saturated fat and cholesterol. Instead, you’ll eat lots of fruits, vegetables and whole grains with low-fat dairy, fish, poultry and nuts. 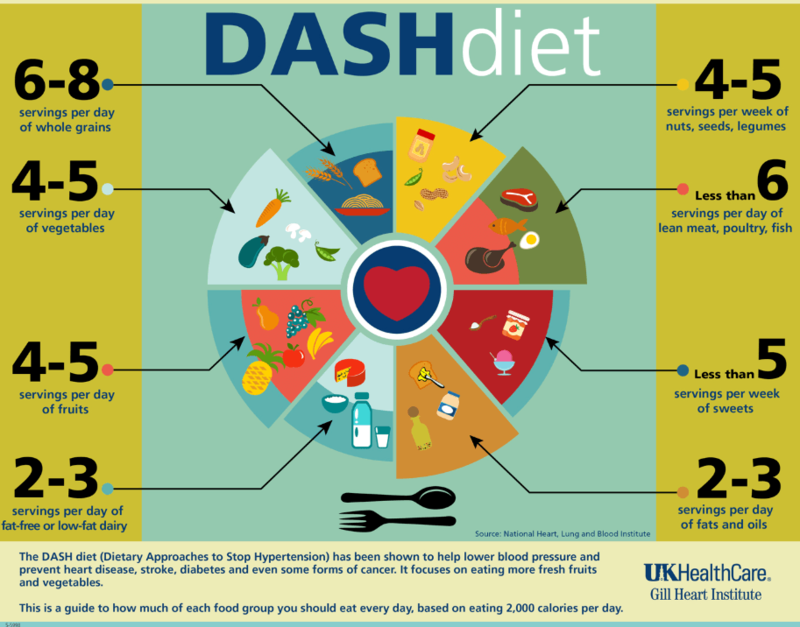 You may be able to eat some red meat and sweets, but they are seriously limited on the DASH diet. Take a look at the University of Kentucky’s recommendation for suggested serving sizes below. Both the Mediterranean and DASH diets have evolved beyond a trend possibly because they both recommend eating natural foods, healthy fats and ever-important green vegetables. Let’s take a closer look at what makes these diets so effective. 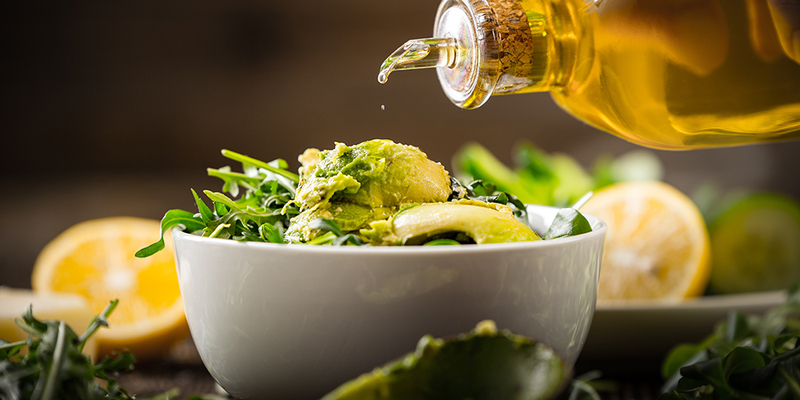 Healthy fats: Not all fats are bad for your health. In fact, the body needs healthy fats like monounsaturated, poly-unsaturated and omega-3 fatty acids. Both the Mediterranean and DASH diets include some healthy fats. Nuts, coconut, fish and some oils are great sources of healthy fats. Whole grains: Grains are an important source of many nutrients, including fiber, B vitamins and minerals like iron, magnesium and selenium. Whole grains include foods like brown rice and whole-grain bread. Green vegetables: Green vegetables are the superstars of these diets because they are rich in vitamins, nutrients and antioxidants. Not only do they contain high amounts of fiber, but they also are rich in vitamins like A, C, E and K. They also contain an abundance of antioxidants that can protect your cells from oxidative stress. And although there’s a long list of good stuff that’s included in greens, what’s excluded is equally important. Green vegetables do not contain unhealthy fats, excess calories or loads of sodium. If you’re eating the standard American diet, you’re probably not getting enough greens. According to the USDA’s MyPlate recommendation, women should get between 2 to 2 ½ cups of vegetables daily while men should get between 2 ½ to 3 cups. When you follow the Mediterranean or DASH diets, you’ll have this requirement covered. All green vegetables can be considered nutritional powerhouses, so feel free to choose the ones that suit your tastes. Just be sure to vary your greens to get a variety of nutrients and antioxidants in your diet. If you’re considering trying one of these diets, first take a look at the nutritional profiles of the following greens you should incorporate in the diet. Kale: No one can argue that kale is a nutritional powerhouse. One serving contains more than 100 percent of the recommended daily of vitamin A, vitamin K and vitamin C. Because of its low calorie content, kale is one of the most nutrient-dense foods on the planet. In fact, a 2014 peer-reviewed study awarded kale a nutrient density score of 49.07. 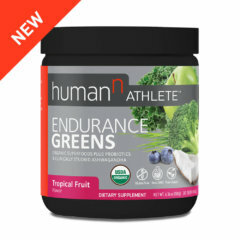 This score was calculated as a mean percentage of daily values based on a 2,000 calorie diet for 17 nutrients, including potassium, fiber, protein, calcium, iron, thiamin, riboflavin, niacin, folate, zinc and vitamins A, B6, B12, C, D, E and K.
Spinach: As you learn about the nutritional profile of spinach, you may start to realize that Popeye knew what he was doing. Spinach is a great plant-based source of iron, calcium and magnesium. It’s also one of the best food sources of vitamin K and vitamin A. The benefits don’t stop there, spinach contains healthy omega-3 fatty acids, B vitamins and many other nutrients and antioxidants. We can only guess that Popeye knew spinach would rank nearly a perfect score (86.43 out of 100) on this powerhouse vegetable review. It’s that good. Spirulina: Spirulina is a green vegetable that comes from the sea, and it’s unlike any other soil-based vegetable. One thing that stands out about spirulina is its protein content. With 4 grams of protein per tablespoon, spirulina is among the best plant-based proteins. 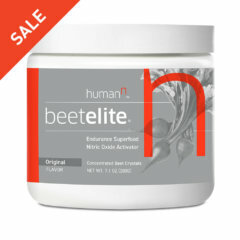 This sea vegetable is also known for its vitamin B, copper and iron content. Celery: You may reserve celery for hot wings or cru d’etat, but this green vegetable deserves its own spot on your dinner plate. Celery is a rich source of various vitamins, minerals and fiber, but it’s the vegetable’s antioxidants that really stand out. 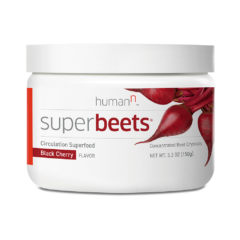 A 2017 review of the antioxidant capabilities of celery found that this vegetable’s powerful antioxidant powers are thanks to included compounds like caffeic acid, p-coumaric acid, ferulic acid, apigenin, luteolin, tannin, saponin, and kaempferol. If you’re trying to choose between the Mediterranean and DASH diets, consider which better suits your lifestyle. Both are heavily focused on green veggies, but if you feel good on a diet with healthy fats, the Mediterranean diet will be a better fit. On the Mediterranean diet, you can enjoy fatty foods like hummus, olive and olive oils and even an occasional glass of wine. With the DASH diet, you’ll enjoy meals that include roasted veggies and lean proteins with some grains. Both diets follow healthy principles and include copious amounts of green vegetables. Whether you choose one of these diets or another, make sure it’s rich in green goodness. 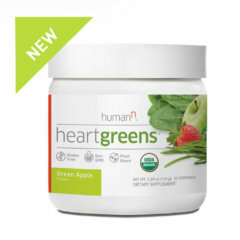 If getting your hands on your recommended daily greens sounds daunting, check out HumanN’s HeartGreens and pack an army of organic super greens an fruits into your morning glass!